Matt Sanborn ’19 scored a power play goal with 1:48 remaining in the game to give the Clippers a 5-4 victory over Class A Cheverus. The win keeps Yarmouth’s playoff hopes alive as they head into the last three games of the regular season. The contest did not start off well for the Clippers as Cheverus converted a 2-on-1 into an easy tap-in goal only 26 seconds into the game. 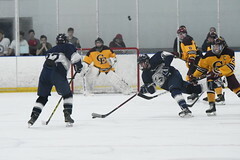 But Yarmouth bounced back on the ensuing face-off when Sam Marjerison ’19 went forward with the draw and Aidan Miller ’20 broke into the Cheverus zone to score on a wrist shot. After the opening fireworks, the Clippers struggled with puck possession in their zone, however, Charles Henry Watson ’22 was up to the task with a number of strong saves. With a 10-5 shot advantage in the period, Cheverus finally beat Watson and took the lead at 2:40 and enjoyed a 2-1 lead after one period. 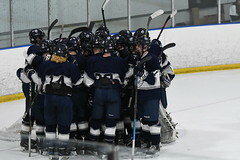 In the second period, Yarmouth began to move the puck more effectively, which generated some offense. 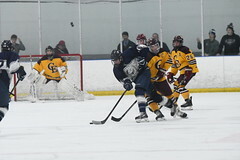 Kurt Heywood ’19 (King, Robichaud) scored a power-play goal off a one-timer from the point, which evened the score, and Aidan Miller (Marjerison, Giese) picked up his second goal of the game to give the Clippers a 3-2 lead at 10:15 of the second period. As the game progressed, a parade to each team’s penalty boxed ensured. However, Spencer King ’20 extended the lead to two with an unassisted, short-handed tally and the Clippers appeared in control. Nevertheless, Cheverus was not going to make it easy and Cheverus bounced right back with a power-play goal less than a minute later to cut the lead to one. Yarmouth led 4-3 after two periods, but at 11:58 in the third Cheverus tied the game and undisciplined penalties by both teams turned the third period into a series of special team opportunities. A succession of Cheverus penalties including a five-minute major gave Yarmouth an extended 5 v 3 power play, but the Clippers struggled to move the puck for quality scoring opportunities. After a rousing rendition of “Happy Birthday” from the Ultras earlier in the contest, Matt Sanborn took matters into his own hands on the 5 v 3 advantage and fired a wrist shot that beat the Cheverus netminder with 1:48 left in the game for the 5-4 win. The Clippers have a record of 2-0-2 against Class A opponents this year, but will be facing their biggest games of the year against divisional rivals Greely, Leavitt and Cape over the next week as they fight for a playoff spot.